Franklin has always lived in the same house in the same town, and he’s grown up with the same friends. In this Franklin Classic Storybook, new neighbors move in—the Moose family! At school, Mr. Owl asks Franklin to be Moose’s buddy. Initially, Franklin is afraid of Moose because of his size but he soon realizes that despite their differences, he has made a new friend. Since Franklin’s friend Otter moved away, nothing seems to go right—until Franklin figures out a way he and Otter can stay friends. 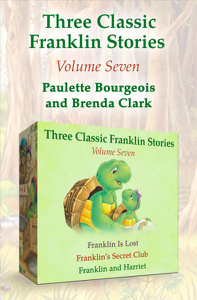 Another Franklin Classic Storybook to delight young readers. In this Franklin Classic Storybook, Franklin can’t wait for his best friend Bear to come over for their first sleepover. However, when it’s time for bed, Bear begins to miss his own room—until Franklin comes up with an idea to make Bear feel more comfortable.